How do we do it then? How do we develop leaders? What is needed? To get started, you need a shift in your leadership culture. Every organization has a leadership culture. In its simplest terms, a leadership culture is the personality of an organization. It’s who they are. So … your organization has a culture. It may or may not be healthy or poised to accomplish what its mission is. But there is one. Believe me. Over the next few weeks, starting with this post, I’ll present a brief overview of what leadership culture is, and tips on how you can begin to assess the health of your culture. Plus, I’ll show you what you can do to start creating a culture that is conducive to developing leaders. At its core, culture is about VALUES. These are the things that are most important to us. Some of these values can be tied to what we believe. Truths that make us who we are. Those are great, but your culture has other values that make you who you are. Let me ask you, what is most important to you? Here are some examples. Some are from churches, some from not-for-profits and some from businesses. Church values: Some churches value reaching people, some value spiritual growth and discipleship, some value developing volunteer leaders and some value people serving, with pastors and staff doing most of the actual leadership. Not-for-profit values: Some not-for-profits value impacting people’s lives directly through their fundraising, others value shoring up resources or changing the legal landscape, and some value the preservation of history. Business values: Yes, businesses have values, too. Some value their employees above all else, some value customer relationships, some place shareholders and profitability in the most important place. Again: What is most important to you? If I were to come hang out with you where you work, and I just observed for a while, I would be able to see, or catch what it is that is most important to your organization. How you relate to each other, what you emphasize the most, and so on. Be careful when thinking of your values and in what is most important to you. In too many circumstance we list values that we think are supposed to be important to us, instead of what we truly value. Understanding your culture requires you to be brutally honest with yourself as a leader, as well as with your organization. Recently a pastor confided that his highest value was that he be an amazing speaker, and that the people in his community “flock to hear him speak” (his words). I admire his honesty, but if that is his highest value, his church will hit a wall pretty quickly. What is most important to your organization, now and for the foreseeable future? 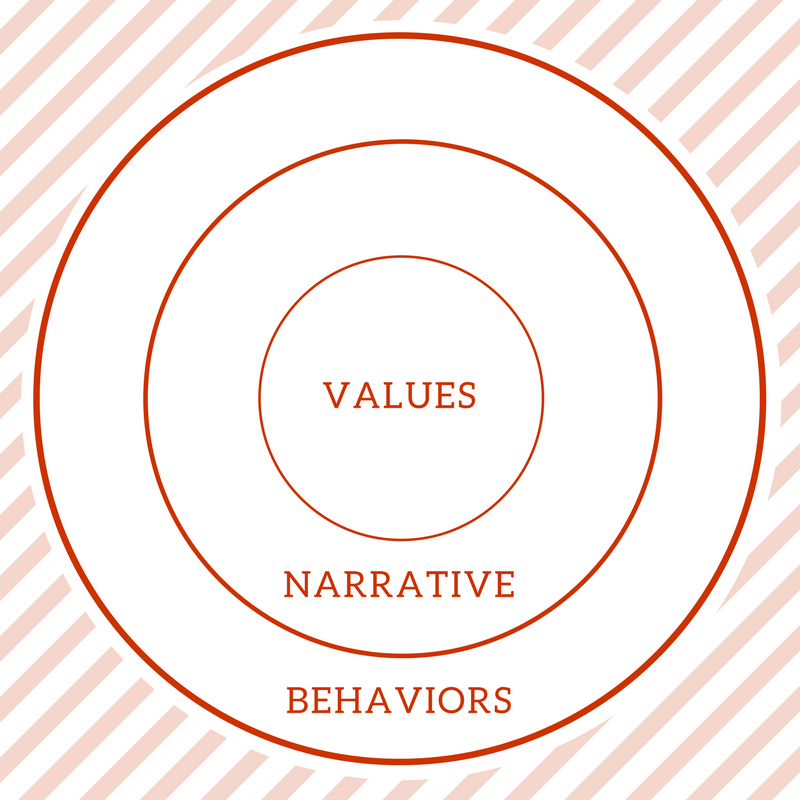 Next week, I’ll talk more about the second circle – Narrative. After that, you guessed it – Behaviors. And in a few weeks, I’ll be sharing a resource for you to use to start assessing your leadership culture. Ready to spur growth and shift your culture? Get started now to pinpoint what your values are. In the meantime, tell me … what is really most important to your organization – what are your values? Let me know in the discussion below.